Charles Trenet was one of the most popular performers of the Chansons era. Boum! was his first hit in 1939 and probably his signature song. 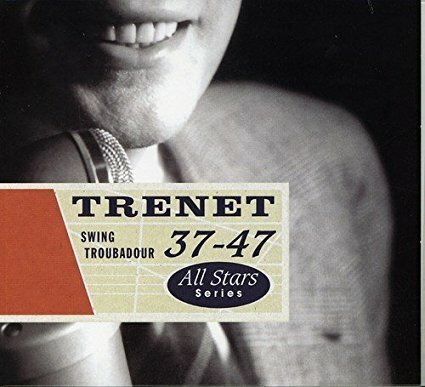 The most notable thing about Trenet is he wrote most of his own songs at a time when singers didn't write songs. He was born May 18, 1913 in Narbonne, France. When his parents divorced, Trenet was sent to boarding school. But he returned home with typhoid fever. It was during his convalescence that he started exploring the arts. Trenet went to art school in Germany and France. Then he moved to Paris. While working as a prop master in a film studio, he performed with pianist Johnny Hess as Charles and Johnny. They appeared on radio. The duo ended when Trenet went into the military in 1936. When he returned in 1937, he signed with EMI's Columbia label. At first he was compared with Maurice Chevalier. But Trenet forged his own path by writing his own songs. Boum! was his first big hit in 1939. He won the Grande Prix du Disques. He performed it in his first film La Route Enchantee which he also wrote. That Trenet wrote his own songs and even movie scripts was one of the reasons he had longevity. He remained very popular through the 40s with La Mer which when translated to English became Beyond The Sea. After WWII, Trenet moved to Hollywood. He had some success but he returned to Paris in 1951. Trenet faded on his later years. But he continued to perform and record until his death on Feb. 19, 2001 at age 87. This comp from Sunnyside is a good intro to Trenet's music. Here's Charles Trenet performing Boum! in the 1938 film La Route Enchantee.